Flavorful, but not too sweet. 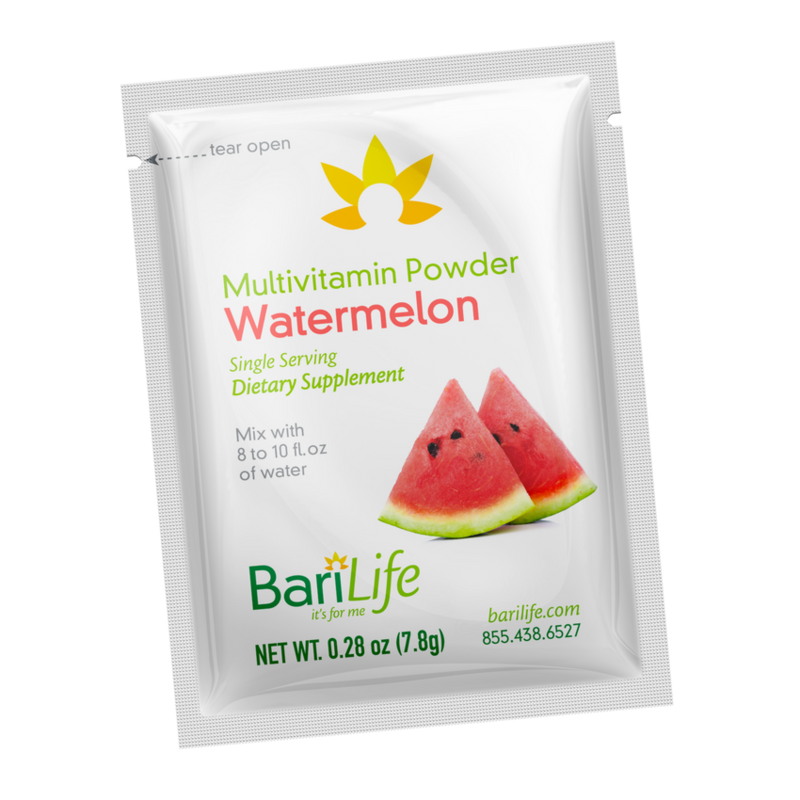 Bari Life’s watermelon flavor will never get old and makes taking your vitamins effortless and delicious! Mix the powder into 8 – 10 ounces of water for a nice, mild taste. You can add as much or as little water as you want! You can also combine it with your favorite juice or beverage. Try our refreshing Lemonade🍋, too! 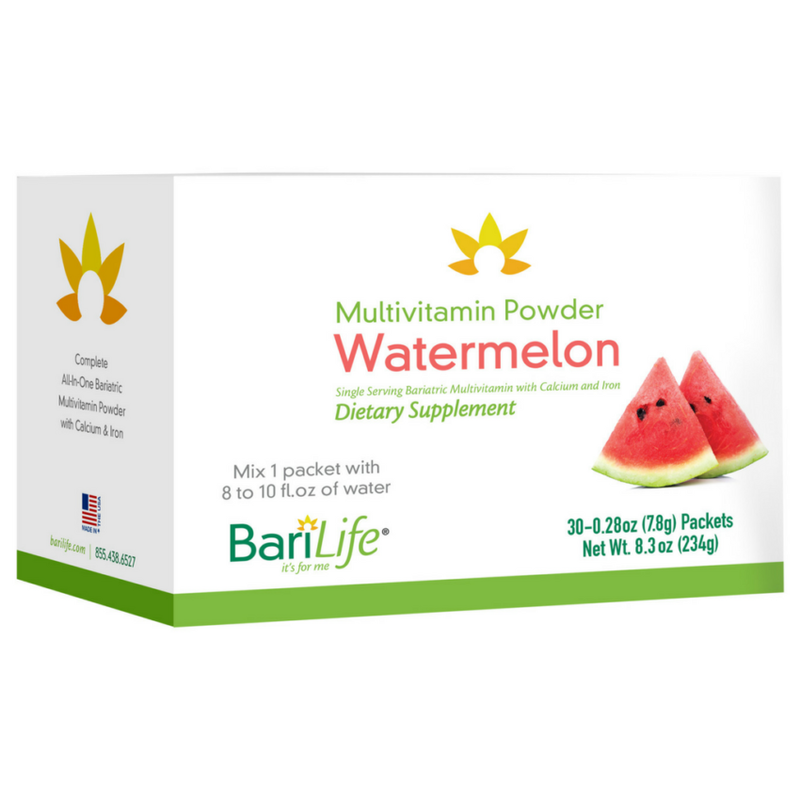 Gastric Bypass and Vertical Sleeve patients only need to take two Bari Life Multivitamin Powder Packets a day to meet all vitamin and mineral recommendations, including all calcium citrate and iron! There are 30 multivitamin powder packets per box making this a 15 day supply of vitamins. This would equate to a one month’s supply for Non-Surgical and Gastric Band patients and a 10 day supply for Duodenal Switch patients. Little sweet but was able to drink it for sure. I really thought it would taste like garbage because, in general, vitamins are pretty disgusting. But this product is surprisingly good, and I will definitely be buying more! This one has to be my favorite. I’ve tried both Lemonade & Watermelon. The watermelon reminds me of a aqua de melon. Not gritty at all. I like the packets, they make taking this on the go simple. Good flavor. Watermelon Single Packs are the BOMB!!! I live this product. I have to do the 6 vitamins a day (2) three times a day and they are very hard to swallow for me. This powder I only have to do 2 times a day and I get to drink it. I switch out doing both. I do the pills during the week and on weekends I feel like it is my cheat day with the liquid watermelon packets. It’s great. I knew the lemonade came out first but I could not drink it because it would cause me to have bad acid reflux and then this jewel came in. What a great prize!!!! As McDonald’s logo says “I’m loving it!!!!! This has a great flavor not at all what I expected!!! I have problems swallowing large pills, so I knew powder would always be my choice. Most watermelon supplements taste very sweet. I received a sample with an order I placed. I LOVE the watermelon taste. It has a refreshing taste. It reminds me of watermelon infused water. 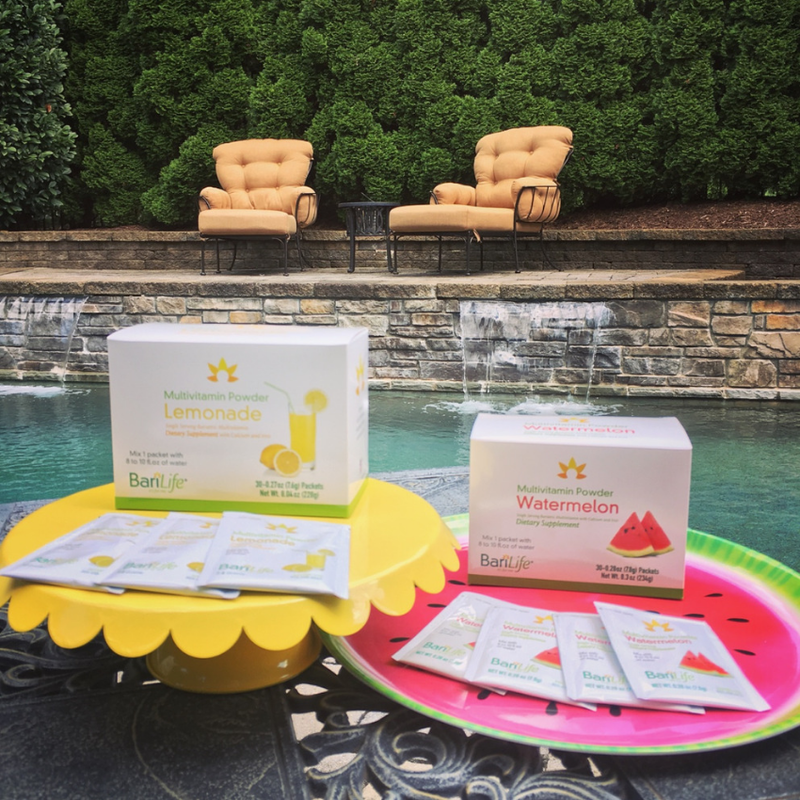 I have the lemonade on hand, but plan to order the watermelon to alternate. Easy, convenient little packages to take my vitamins anywhere I am. Watermelon vitamin powder is delicious! I really like the flavor. This is the best tasting vitamin powder I’ve tried so far. I like to mix it in something though. Love the vitamin watermelon powder. Just ordered 2 more boxes. 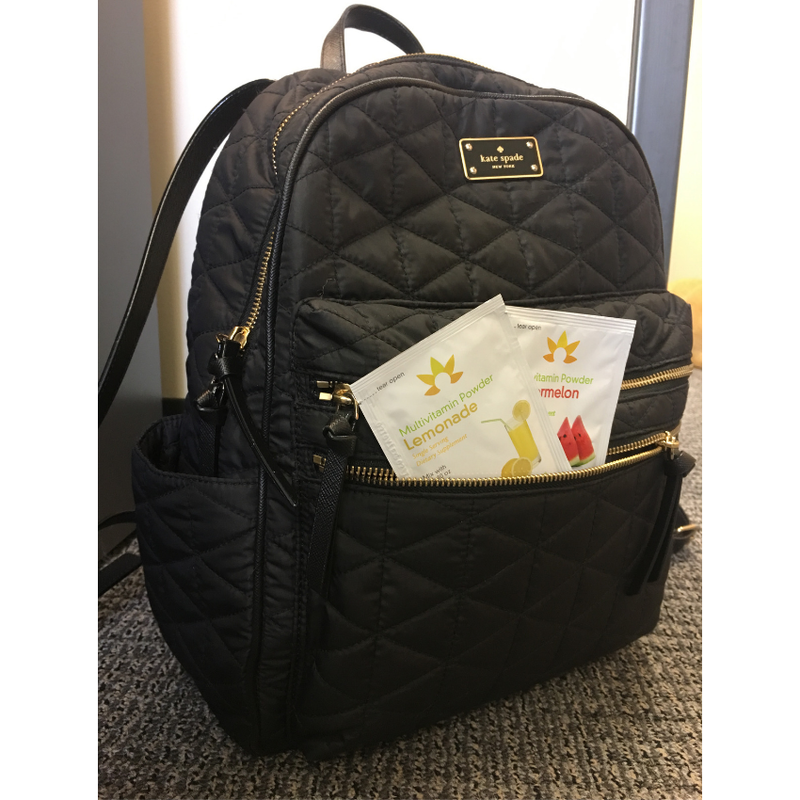 I was skeptical of this product since vitamins tend to not taste good however, I read the reviews and followed the advice of others and was very pleasantly surprised at the delicious taste and ease of use of the pre-measured packets. I am excited to know that in this area of my post-surgical care, I will be able to be compliant in taking the bariatric vitamins I will require. An excellent product!! 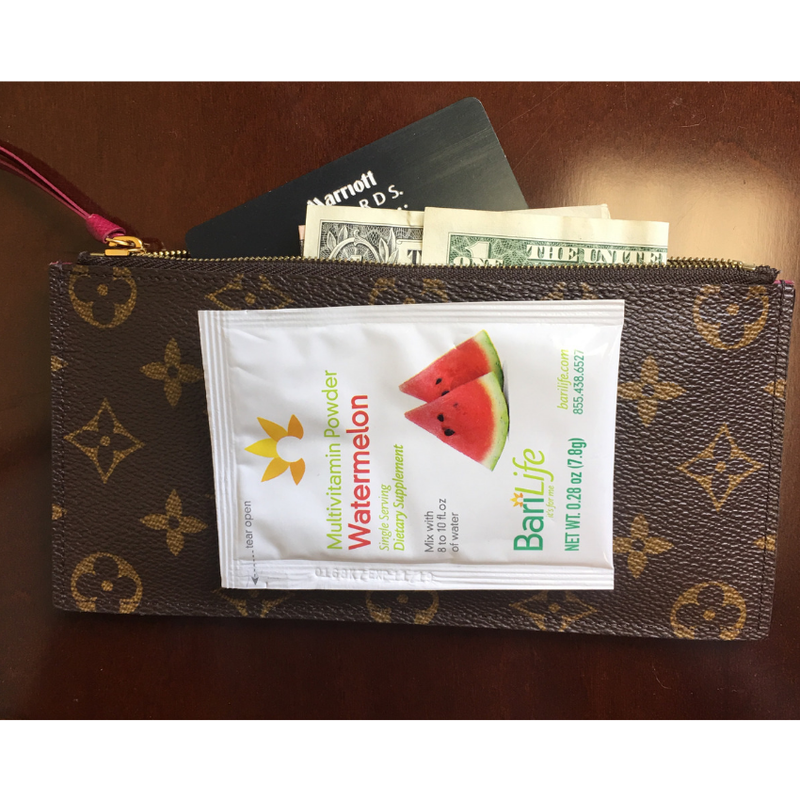 I love the watermelon flavor and the individually package makes it easy for on the go. I love these vitamin packets! So easy to take with me. I mix it in my yogurt. My lab work has always come out good with this. Watermelon flavor is amazing! When. I don’t have time for yogurt, I mix it into a 4 oz shot glass with water and go on with my day. Highly recommend this! I ordered the lemon flavor because I DO NOT like watermelon and needed a change from pills. I had forgot my lemon packet at home but had the watermelon. To my surprise it taste like berry Kool-Aid. I loved the taste so much that I switched to the watermelon flavor. Cant wait until my neck order comes in. Thank you for the sample. I would have never of thought to trying it if it wasn’t for the sample. I tried very hard to make this work, but it just wouldn’t. I had to continually stir the drink to keep it mixed, but even that didn’t help as it got to the bottom. The taste was so bad it left me throwing up, the ONLY thing that has done this since my surgery. The watermelon flavor starts good, but as you continue to stir and get to the bottom it is gritty and horrible tasting, no matter how quickly you try to drink it. I would not recommend! 1 shot of powder,1 gulp of water your done after 3rd time. Its fast and easy with best part is that you took your vitamins for the day. When I first had my BPD in 2014, I used these powder vitamins and they were just okay. Then for some reason they got reformulated and I could not take them. Terrible formulation. So…I went to buying my vitamins online and trying to figure out the correct dosage on my own. I was able to do this but it was a lot of pills to swallow. Recently, I learned that the powder had been reformulated. I tried both flavors and I prefer the watermelon. It is wonderful. Although, I have to keep shaking it to keep it mixed well, I do not think it is gritty like other products. I am thrilled to do away with a hand full of vitamins and drink my vitamins daily. Love this in the morning! I use this packet in the morning. Mix it in with my protein (Nectar Caribbean Cooler)powder. Yummy! Mixes well with water in my shaker bottle. I use 12 ounces of water. Delicious! Have to shake a couple more times before I’m finished to keep it from separating and settling at bottom of bottle, but not a real effort. Still better than Gummies or Chewables. Surprisingly good! I like it almost as much as the lemonade flavor. Now I can alternate so I don’t get sick of only having the lemonade. Thanks! I am enjoying the convenience of the pills and the watermelon packets! I can honestly say, I do not mind drinking this. It tastes good and ironically enough gives me the sense of being “naughty”. I also love that it’s bariatric specific so I’m confident my husband and I are receiving proper vitamin intake. It is sweet but with a little extra water it is perfect. I use this product every morning. Its a refreshing start to the day and gives me the sweetness I need to enjoy just plain water for the remainder of the day. I typically am not a fan of watermelon flavors, but his one is sooooo good! Before my surgery I thought these tasted like a watermelon jolly rancher and I liked them ok mixed in really cold ice water. After the surgery they are so sweet they make me literally gag. I have tried them every way possible (straight onto the tongue, shooting them, in ice cold water, etc.) because I didn’t want to waste my money. I just cannot do these powders anymore. It is really good but for me a little too sweet… of course I may not be using enough water. I would recommend this product. Is a powder vitamin available without iron for my rou en y stomach? I had surgery about eight years ago. I believe the iron is making me hungry and gain weight. I am also a little jittery from all the extra energy I have. Hello Toni! We do not have an all-in-one formula without iron. It is recommended that patients get at least 45mg of Iron after bariatric surgery to prevent iron deficiencies. Our all-in-one formula ensures that you get the recommended amount if you take 2 scoops per day. One thing for you to try is taking a half scoop at a time, but if you want to get the full ASMBS recommendations then you still need to make sure you take 4 half scoops each day. The best thing for you to do would be to consult with your bariatric team on your symptoms. If you have any more questions feel free to reach out to us! First I love anything watermelon so that is a plus and they are just the easiest way for me to keep up with taking my vitamins. I used to take gummy vitamins and I can’t believe how much better I feel and how much money I’m saving now that I take these vitamins instead. My labs have improved tremendously. Will be using these from now on.